...on a quilt made by my grandmother. There is a tradition of memoir told from both perspectives. We have inner monologues about a person's life in a given place that provide a slice out of time picture. We also have the other extreme such as Black Like Me that tells a story from a perspective that could only be manufactured. Everything here is valid; I don't have any criticism for one or the other as they tell the story in different ways. However, there is another layer on top that involves the expectations of the audience and their inherent bias and suppositions. Hillbilly Elegy was promoted as a portrait of Appalachian life and culture. I had read several reviews (from national publications; I should also read reviews from regional papers), that touted the book as a view into the lives of Appalachians. This is simplistic and not something I think the author intended. It's possible to attempt such a book; it's just not what this book is. The risk of promoting or reading it with that purpose in mind though is that, of course, one gets a skewed image of 'those people' (in the same way that you can't read a book about a Chinese family in Chicago and know all about Chinese people). What it does relate is a simultaneously tragic and hopeful story of one man's experience growing up in Ohio and Kentucky. Much of it resonated with me; I wasn't raised in the same poverty or difficult family situation as he but it was always something a few doors down. If you're from Appalachia, you are never far from poverty; however, most people are also distant from extreme wealth as well so I think, at least in my experience, there was a certain type of equity (you didn't think less of neighbours or relations because they had less as long as they were upstanding good people). The picture J.D. Vance relates in his book chimes with that but the tragic trajectory of his story brings us into the present where people are giving up hope and aspiration. The book has called on me to reflect further on whether I still look at West Virginia from my perspective as an insider or now from outside. The several times I've been back in past years to my parent's (and grandparent's) hometown, I've visited a place in decline and decay. Almost the only people who are left are pensioners and apparently younger people are mostly on welfare. There seems to be little life or industry to the place or people (the county has the highest unemployment in one of the poorest states in the nation). I remember, as a child, seeing this same place as a more vibrant and interesting. How much of this change is what happened in the place or what has happened from my change in innocence and experience? I can sense the damage to the place brought by years of exploitative industry—to both the land and the people. There is this evident decline in spirit, like a draining in colour visible in people across the state (witness the ill health, obesity, and prescription drug addiction). I also struggle with leaving 'home'. Vance now lives in San Francisco; I'm on the other side of the planet in Sydney. Like so many Appalachians, we've felt compelled to leave in order to make sensible lives for ourselves. For some of us, there will always be a gnawing call back to the hills and this feeling that we've abandoned them. The opportunity for careers there are limited; but, equally, the opportunity to bring healing to a damaged place and people is overflowing. I hope that people can read the book and look past their own suppositions about the region; it's not simply a huge swath of land populated by rednecks. It's clear that, especially with the election of Donald Trump and the shock that followed in the wake of this, much of the country does not understand the social and economic situation of people in Appalachia. To think 'they' are just a bunch of lazy people on the dole is to misunderstand the promise that was given that they could work hard and obtain a decent life. For millions of people in the region, it's not that this isn't a given—it's truly out of reach. Appalachia has this knockabout history of poverty and despair; that's the picture that's been in the travel guide for generations. But, I'm not entirely sure how true that's been on the whole when jobs could be had and there was some way to keep one's family fed. Now, we need to hear and retell these stories. We need, both on the inside and out, to consider closely what is happening as there is always some means of empowerment in this. We need the truth of what has happened—but, again, as I said in my last post, we also need better stories about what is possible. Perhaps, regardless of where we are, 'The Expats of Appalachia' can write both into being. When C.G. Jung was in his late 30’s, he passed through what he called his creative illness. During this time, he composed a book concerning the content of his dreams. He mentions this book in his writings, but very few people have ever seen it; after his death, the family locked it in a vault…and so it has been under wraps for nearly 100 years. However, for whatever reason, they’ve decided to release it to the public! This is the diary of one of the fathers of psychology as he passes through a psychological illness (he realised what an opportunity it was that he was able to observe the process and record it). 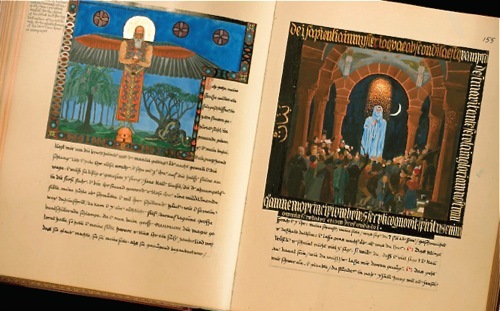 The book itself is fantastic; it’s bound in red leather (he called it The Red Book) and looks like someone cross-bred Blake and Tolkien. I’ve just come across this article on Mike Davis’ book Planet of Slums. Note the juxtaposition of the book cover and banner ad. Humans make reality; or, rather, we build our society and psychology based on notions of what reality is or should be. These notions are generally understood to come from individuals; the citizens of a “free” country are the masters of their own destinies. They are capable of making decisions that shape everyday life and the future. Thoreau and Edwards contend the issue is more complex. In Walden, Thoreau proposes these decisions cannot be made freely unless the individual chooses a life and manner of thinking that allows for freedom; a century and a half later in Free to be Human, Edwards questions whether the structure of society and economics allows for intellectual freedom at all. bq. The gross feeder is a man in the larva state; and there are whole nations in that condition, nations without fancy or imagination, whose vast abdomens betray them. Reading Walden is a delight (though I had forgotten how Mr. Thoreau tends to ramble. Still, a delightful ramble). I’ve wondered how things would be different had people actually taken his words to heart or, were he writing today, what his advice would be per the situation we are in. But, those thoughts are moot. I somehow doubt we are any better equipped to hear such words today than a century and a half ago. It is not the time or society that squelches wisdom—it’s the deafness of our own nature. My hope is that some larva do become butterflies. In general, a dominated consciousness which has not yet perceived a limit-situation in its totality apprehends only its epiphenomena and transfers to the latter the inhibiting force which is the property of the limit situation. The first time I had food poisoning was from a hamburger in Cody, Wyoming. It was not pleasant; I ended up hospitalised. I do not know what circumstances contributed to that particular instance. Was it improper washing of a dish; mishandling of the ingredients during preparation; bad meat from the wholesaler; improper packing or slaughtering? From my plate (it was a plate; we ate in a “family-style” restaurant) to the beast that provided the raw material, there is a line of potential mishap. At one time, during the middle part of the 20th century, the instance of mishap was abated by government regulation and the fact that most of the meatpacking industry consisted of well paid, unionised, career meatpackers. This is no longer the case. I have just finished reading Eric Schlosser’s Fast Food Nation: What the All-American Meal is Doing to the World. It is a thoroughly researched account of the history, marketing, employment practices, safety issues (both the food itself and the people working with it), economic ramifications (from the “farm” to the counter), and worldwide reach of the fast food industry. I’ll not rattle off statistics here; however, it’s enough to say that a particular fast food restaurant’s logo is now more widely recognised worldwide than the Christian cross. Its mascot is more trusted by children than many other given authorities. It is the largest purchaser of beef and potatoes in the United States and one of the largest employers. With this power, it has vast influence over agricultural practice and government policy concerning wages and the environment. The book is a bizarre and, at times, harrowing account of what goes on behind the facade of happiness promoted by the fast food giants (after reading once chapter in particular, I broke down into tears). This is a truly unpleasant book to read (certainly not for the weak stomached). It is not a tirade against any particular company or industry. If anything, it is somewhat sympathetic to men who were the original pioneers of this phenomenon; they were living out the opportunity of the American Dream. What is does do is trace the results of dreams when compounded with massive amounts of money and the unchecked openness of American society to allow corporate growth (and the self-regulation of these corporations). I have had food poisoning several times since that first incident in Wyoming; this is to be expected, I’ve travelled all over the world to some fairly dodgy places. However, the dodgy places are not where I’ve been poisoned. Except for one instance, it’s all been in the States. After reading this book, I’ve a better understanding of why that may be.